"Between June 1941 and June 1942, the FTC [Federal Trade Commission] examined 362,827 print ads and found that only 20 percent of them carried false and misleading representations. Of the 1,000,450 radio commercials the FTC examined, only 2 percent were found to be false and misleading" (pg. 34). So when I see picture like the ones shown here, it makes me think about the effect of truth on the society as a whole. 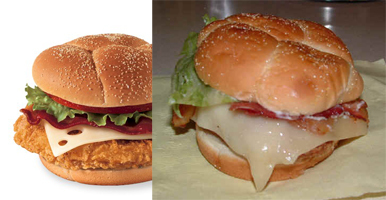 As hilariously detailed here, there is a vast difference between fast food advertising and the actual product. I'm not coming at this from a legal standpoint. When advertising is so removed from the actual product, doesn't that effect the social contract between the producer and consumer? Sure, there are some instances where we expect to be messed with. I do not actually think my McDonald's hamburger will look like it does on the billboard. Where else is a little duping assumed to be part of doing business? Used cars. Compassionate conservatism. We understand this is just price of doing business in the world. But my issue with the fast food pictured here is not the advertising. Rather, the issue here is a terrible product. The photographers who took the awe-inspiring pictures sprayed hairspray on the burger and covered it in Vaseline to show the best a burger can be. I have no problem with that. The problem is that the reality is so much less than that which was advertised. We do not expect our ads to reflect reality. And with competent oversight organizations, there is a minuscule amount of actual lying (as compared to the Turow figures from the early 20th century). The best advertising is truly making a good product and improving the lives of consumers. Sometimes this just means doing your job really, really well. It also means viewing your business from a user-centric perspective - not just how they interact with your product (though this is important), but also how your product plays into their lives right now. This story from Zappos is a great example of how simple quality is doing more for advertising a product than any number of ad spots. I encourage you to read the story and note that the quality of the shoes is not a focus. The focus is on the human interaction. The relation between the Zappos story and the fast food example above is the oft-overlooked reality that we aren't really buying products - we're buying the experience. It seems overly simplistic, but the best advertising is providing the best product with the most focus on how it effects the customer. This may sound like a bunch of feel-good wankery, but count the number of times this does not happen to you today. When you buy coffee, how often does it drip down between the lid and the seam in the cup? When you put that cup of coffee into the beverage holder of your car, does it block your access to other dashboard controls? Add up these instances during your day today and you will agree that my argument is neither overly-simplistic nor a focus of most companies.